The industrial style, also known as urban style, is a decorative style that has its origin in the typical architecture of the industry. 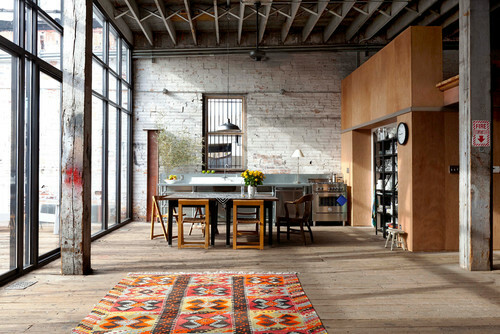 The industrial style has a history and involves young New York artists, who in the 1950s chose to live spacious and spacious factories filled with beams, bricks, and concrete. 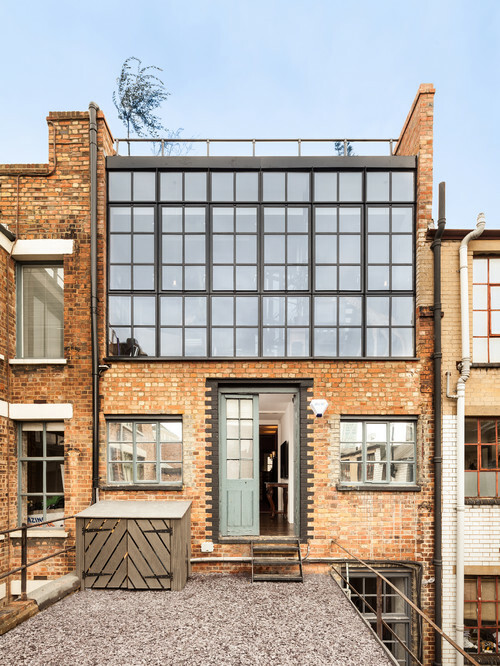 More than half a century later the industrial style is still in fashion, being one of the most successful eclectic styles in recent years in decoration magazines. The industrial style can have certain retro and vintage tics, since it uses old elements like furniture oxidized or worn by the passage of time. Below we offer you the best ideas to offer an industrial style to your home. 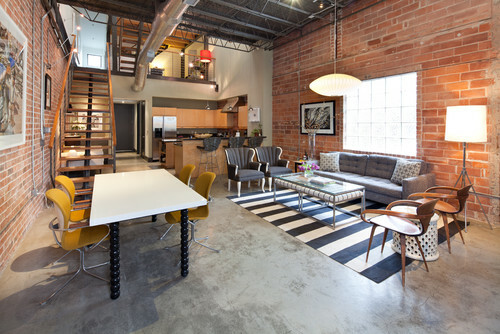 Industrial style One of the characteristics is the use of space with open, wide and open areas. It is typical to find this type of urban decoration in lots of industrial styles, where furniture and objects can breathe and enjoy their own space. As we have explained, this type of decoration is inspired by the New York industries of the 50’s, where these spaces were rehabilitated in spacious houses, hence this decorative style can refer to the aesthetics of old, large and spacious factories, designed to That workers could move from one space to the other in a fluid way. That is why it is so common to find so many lofts, where diaphanous areas are essential. Access to an industrial style at home is possible, but for this, we will have to bare its structure, and not only talk about the structure of our home, we will also have to choose furniture that follows this principle: wrought iron furniture with a little rust, Untreated natural woods, veneer, etc. Nowadays in many shops dedicated to the decoration furniture is sold that follow this particular aesthetic, many of them, artificially aged. In the case of pipes and pipes, these can end up being part of the decoration of our home with inspiring ideas. In fact, there are many shelves or furniture that follow the aesthetics of pipes, to strengthen the industrial style of housing. Metal and steel are basic materials in the industrial style. This material can be used in ceilings, walls, furniture, chairs, lamps, accessories and all kinds of ornamental elements. There is a large amount of furniture that has the structure of the metal, following the principles of industrial style: the nakedness of the elements themselves. The structure of the objects is shown in metal, in a Spartan way. However, the metal is very cold, so it is often combined with natural looking wood. Wood is the great ally in this type of environment, as it achieves harmony in the environment. Therefore, in the industrial style is the combination of iron and wood that triumphs above all else. 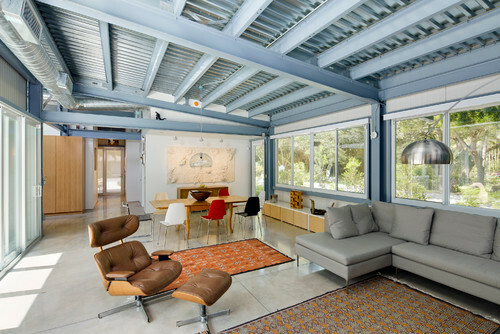 The high ceilings are also characteristic of the industrial style, as it shows all its structure, such as wooden beams or metal roof. The industrial buildings have huge ceilings, which rise upwards to accommodate large machines. However, today not all homes enjoy this type of roof, it is more, only the old houses do, however, not because of it must be abandoned the pretensions of decorating with industrial style, the idea is to adapt our space To the rules of style. The idea is to be able to show the structural elements of the ceiling, whatever its height. 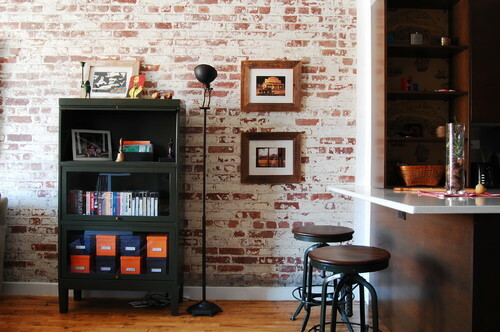 Another way to get an industrial style in your home is to use the brick saw. You can use it in its natural color or paint it in white. Getting this style is not very complicated and you do not need real bricks. 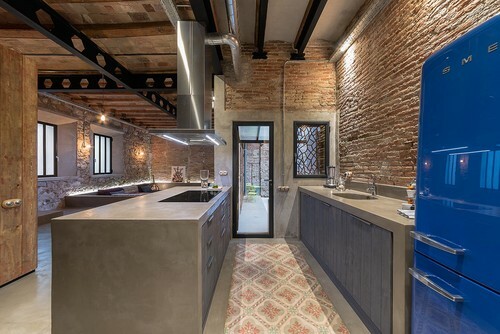 Nowadays in many houses of decoration, they sell decorative paper that imitates very well the texture of the brick, helping you to obtain a 100% real aspect. Ideally, the exterior walls should be brick and the interiors, which are the ones that distribute the space, of the material you prefer, although this is part of the design you make of your home. Do not worry if the brick finish is not perfect, that’s also typical of the industrial style. The large windows imitating the aesthetics of old factories. They are also characteristic in the decoration of industrial style since they look for the entrance of natural light in the stay. It is important not to use curtains or other elements to cover the windows, in any case, it is recommended to use blinds. The industrial type windows are usually very large and spacious and are subdivided into small squares or rectangles covered with a metal structure. The larger the windows, the more light you enter and the brighter you get the room. The industrial style does not look for perfect spaces, it is a style with textures full of irregularities and imperfections. Never look for perfection in polished finishes, ideally show the nick of time in the material used, even when it is work. It is normal, for example, that in a brick wall there are areas discolored or stained, as is the case of the image. It is also part of the aesthetics, that the bricks are irregular or broken at some point. This does not detract from the decor, on the contrary, gives it more strength. In the case of metal, it is common to use rusty furniture or pipes, some of them artificially, showing the nick of time. 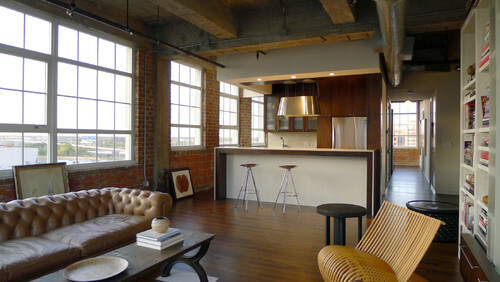 The color palette of the industrial style is: white, black, gray, brown, beige and blue. The palette corresponds to the colors of the materials used in this decorative style, so the dark tones and earth are welcome in this type of decoration. To achieve a feminine and romantic industrial style (Shabby Chic), it is recommended to use a lighter palette, with many white colors and pastel shades. On the contrary, the palette of dark and gray colors is ideal for a much more masculine environment. 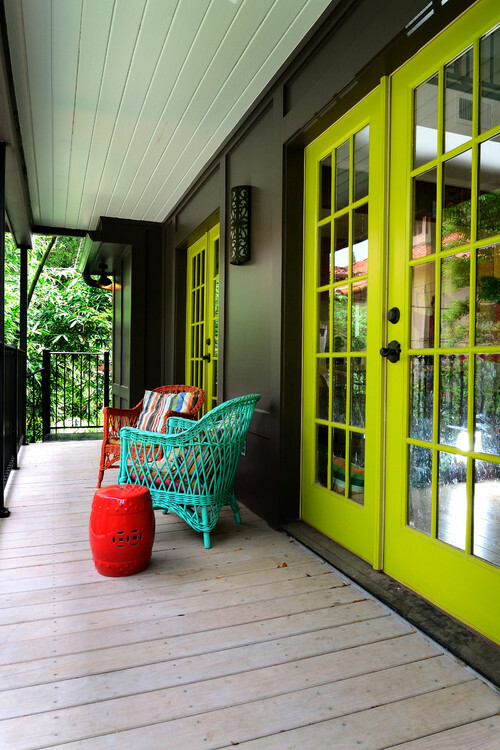 However, it is always advisable to choose the color palette in conjunction with the other elements of the house. Industrial-style furniture is often worn or pickled and is characterized by strong, dark and cold colors. This type of furniture can be found in decoration shops, but if you want to save money, you can also find them in traces and antiquarians usually have unique pieces and with a lot of personalities. We can also find furniture with this decorative style made of metal or leather: chairs, armchairs, tables, etc. The idea is to get antique furniture (not classic) and know how to give their own space in the decoration, especially because they have a great visual load and you have to know how to combine them with other objects and accessories. For an industrial decoration, it is important not to abuse decorative elements since otherwise we would break with one of the maxims of the industrial style: the good use of space. The idea is to choose very well the accessories and objects that we use to decorate our home: retro ceiling lamps, glass bottles, old suitcases, old books, floor lamps, etc. As always, it is important to know how to combine all the elements to achieve a harmonious environment and consistent with what we want to convey. The need for order, which is another of the basic aspects of any decorative style, could not be lacking in the industrial style. How Did Kim Kardashian Actually Lose 10 kilos?